The first Wesleyan Methodist chapel built in Greenfields was a "tin tabernacle" erected in 1890 by Mr. Harris, to serve the growing local population. The corrugated iron chapel was internally lined with wood & lit by gas. 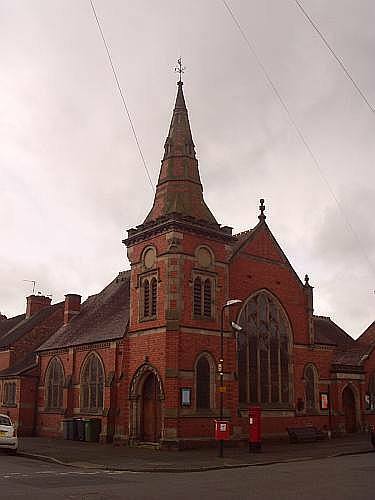 It was replaced by the present chapel; the stone laying ceremny took place on the 23rd April 1908. and the chapel opened on Thursday 15th October 1908 following two years of fund-raising. This chapel is built in the gothic style, of brick with Grinshill stone dressings, and has a tower and spire. It was designed by Messrs F. Davies & Son, and built by Mr T. Pace of Shrewsbury, at a cost of £2200. It accommodated about 220 worshippers. The building is still in use by the Methodist Church in 2018.